Red brick dotted the horizon puncturing deep into the black clouds of industry. Horizons that had once been speckled with gold coated Christian Crucifixes, were now framed in brick and coal. The Party had found its titan, the factory. The mass industrialization of the Soviet Union and its cultural effects came about due to Stalin’s ambitious Five Year Plan. It was through Stalin and his First Five Year Plan that this titan would take over as the center of the Soviet society and life. Stalin’s First Five Year Plan saw an economic shift driven by rapid industrialization and a promise to deliver a new era of communist prosperity to the people. Stalin fueled this rapid industrialization with the notion that it would prevent the capitalist west from invading and tarnishing the communist bloc. Stalin set the lofty goals of increasing electrical output 335% while increasing coal and iron production by 110% and 200% respectively. 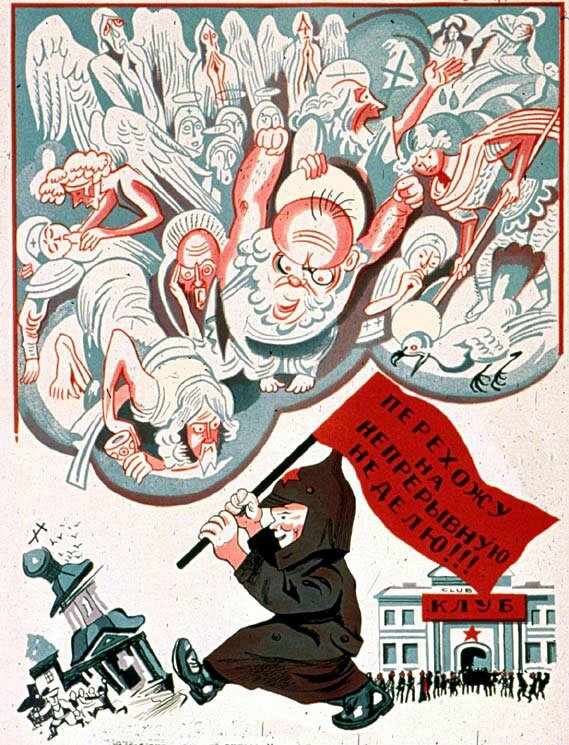 While this plan saw the the growth of the Soviet economy, it also was key in achieving another underlying goal of the Party, the liquidation of the church. 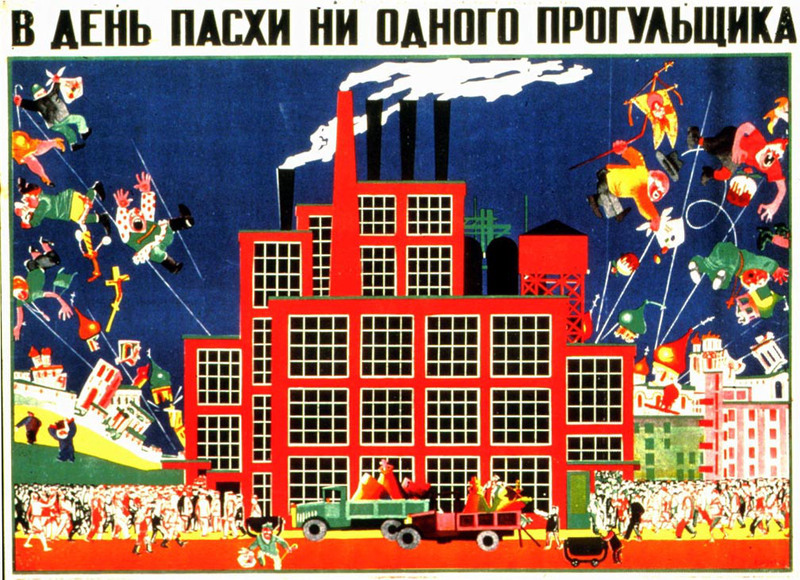 The above image demonstrates the dominance and centrality of the factory in Soviet life and culture. With a beautiful blue sky acting as a backdrop, the picture is dominated by a red factory mighty in stature and rich in socio-political implications. The factory seems to have been dropped in the middle of the city, as if by some higher power. On either side we see its might crumbling the established church and its presence throwing the clergy helplessly into the air. Though the factory dominated this image, most of the activity is taking place at its base. We sees droves of people flocking to and from the factory. 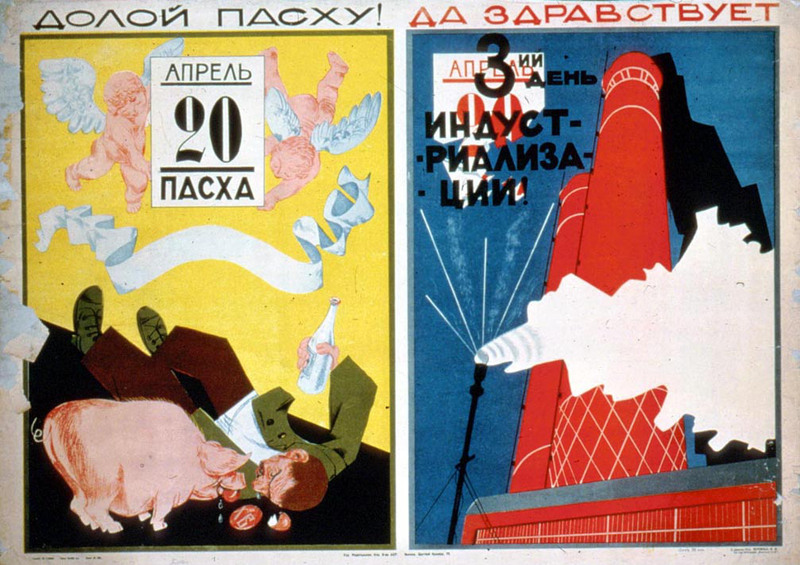 Possibly the most poignant part of this image is the title, “No one Skips Work on Easter!” The Party hoped to see industry drive the proletariate’s life, even if that meant doing away with much of the established cultural practices of the people. Chief among these was the institution of the church. This encapsulates the Party’s image of the factory perfectly. It was not just a building it was a functioning organism that lived to serve the state and produce goods to bolster the economy. The lifeblood of this beast was the proletariate and the Party would do anything in their power to see that this position was retained. These factories would come to serve as the Soviet Union’s metaphorical Tower of Babel; their smoke stacks stretching high into the sky a challenge to all to dare match the industrial prowess of this booming industrial nation. The Russian Orthodox Church had been a cultural landmark and constant in Russian society since its inception in 988 AD. It served as a vessel to deliver information (both spiritual and worldly) to the masses, and was an avenue for the common people to meet and exchange their beliefs, views, and perspectives on the various comings and goings of the world. It becomes readily apparent then why this place of free exchange and free thinking came to be at the top of the Party’s list of institutions it sought to abolish. The Church was an area the Party had little to no influence over. The leaders of the Party thought of it as the “opium of the masses” giving them the opportunity and venue to voice their concerns about the communist government to their cohorts. This belief lead the leaders of the Soviet Union to develop militant atheism, the perscribed and only belief backed by the communist party. This policy called for the destruction of churches, synagogues, mosques and temples. It also pushed for the elimination of religious artifacts and sent clergy men and women to gulags and work camps in the Siberian Tundra. The Five Year Plan only facilitated the process of destroying religious buildings under the precedent of a growing economy and a more prosperous future. 1929 saw not only the First Five Year Plan put into full effect, but also the establishment of the League of Militant Atheists. This organization served the Party and over the course of its existence (1929-1947) would aid in the persecution and murder of 12 million Christians. This demonstrates the lengths the Party was willing to go to see that any organization that they deemed a threat to the Communist vision of the USSR be eradicated. The Church had been a cultural constant within Russia for almost one thousand years. To destroy such an establishment in the name of Communism and industrialization would be to destroy what many considered sacred. It was the ultimate move that showed that communism was not only a economic and political structure, but a way of life that required a devotion, most ironically, similar to that held between the believer and the church. This transition from belief in the Devine to belief in the Party is no small shift and illustrates how the factory came to represent the might, prowess, industry and culture of the Soviet Union by manifesting itself into the Party’s own Tower of Babel. If you want to check out the source material, have a look at these links! Also here are a couple more thought provoking images! I agree with the observation that there is the “shutting out” of the church and that it should be replaced by this life goal of working in the factory. I believe I also observe a capitalist man in the front of the painting on the bottom left who is dressed up very nicely and looks as if he is on his way out. It looks as if he is holding a cane and also a bag of money. This could be an indication as to the dissent towards capitalism as well. The cartoon you used is very interesting and really illustrates the struggle between the “old order” (religion) and the new (industrialization). Thanks for sharing! I really enjoyed this post; the cultural content, the analysis, and the sources all look great. Thanks for including the translation of the title, which emphasizes the secularization of the period. As we near World War II, we’ll see the height of religious persecution extend from Christianity to include Judaism.